The School Reform Commission (SRC), the state body which runs Philly’s public schools, unilaterally and abruptly cancelled the contract with Philadelphia Federation of Teachers. This week that action was enjoined by a local court. The Commission, which had been negotiating with the teachers’ union (PFT), is seeking to force teachers to pay substantially more for their health insurance and has announced its intention to appeal the decision in the state (Commonwealth) courts. The Philadelphia school district, like others throughout the state, is limping along deprived of more than one billion dollars by the administration of Republican Gov. Tom Corbett. At stake in this whiplash fight to fund public education is whether the SRC can abrogate the contract with the PFT, imposing its terms. Educators across the country and from differing perspectives view this latest act as “… a drumbeat across the country that this is the way to deal with your public-sector unions,” said Linda Kajoolian, public policy lecturer at Harvard University (Education Week, Oct. 27). The action of the SRC met a response which could only be called appropriate and dramatic. 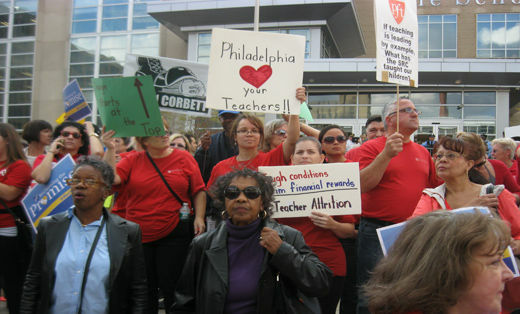 More than 3,000 thousand teachers, students and parents, together with many local trade unionists, filled the city streets in front of the SRC offices – forcing police to block off sections of Broad Street. The red tee shirts of union supporters dominated the visuals. 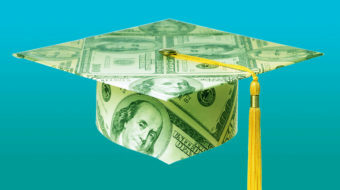 Education supporters are learning to be prepared on a dime. More than 60 of them entered the SRC meeting to testify against the SRC’s action. Among the organizations present were the Home and School Association, the Philadelphia Coalition Advocating for Public Schools (PCAPS), POWER and others. Teachers, they said, not only already fund education through voluntarily purchasing school supplies, but work in high stress circumstances worrying about the next management shoe to fall. Jerry Jordan, PFT President, said employees are not indentured servants and the union had proposed other contributions teachers are willing to make. The under-funding of public education has a long history and predates the austerity years ushered in under Ronald Reagan. The latest effort by the relatively new management of the SRC fills out the politics of privatizing schools, which has meant selling off public schools to the highest bidder in the name of “reform”. The second leg of this policy is to let teachers, school workers and their unions know that their contract is a work in progress subject to the needs or whims of management. Negotiations between the PFT and the SRC have been going on for more than a year. Now Pennsylvania is in an electoral fight to determine who will be the next governor. Corbett, who is credited with orchestrating the annual reduction in state funding for education, is fighting for his political life. Polls consistently show Corbett trailing Democratic challenger Tom Wolf. Some think this current action by the SRC is a “hail mary pass” for Corbett to show undying support for the privatizers and union busters of public education. For-profit interests in the education field and oil and gas extractors have been big contributors to the Corbett re-election campaign. The election this year gives voters an opportunity to speak for education and for taxing the fracking industry. Tom Wolf, Tom Corbett’s opponent, has pledged to increase funding for education and has proposed a five-percent extraction tax. Activists argue that this is an opportunity to oust the right wing governor and elect one who proposes change for the better. Savvy voters are preparing to go to the polls and do the necessary lobbying once the election is history.